TRIPOLI, LIBYA—Italy’s firebrand interior minister vowed on Monday to do everything possible to help Libya stem the flow of migrants and develop itself commercially, saying Italy wants Europe to view its former colony as a “great opportunity” and not a problem. 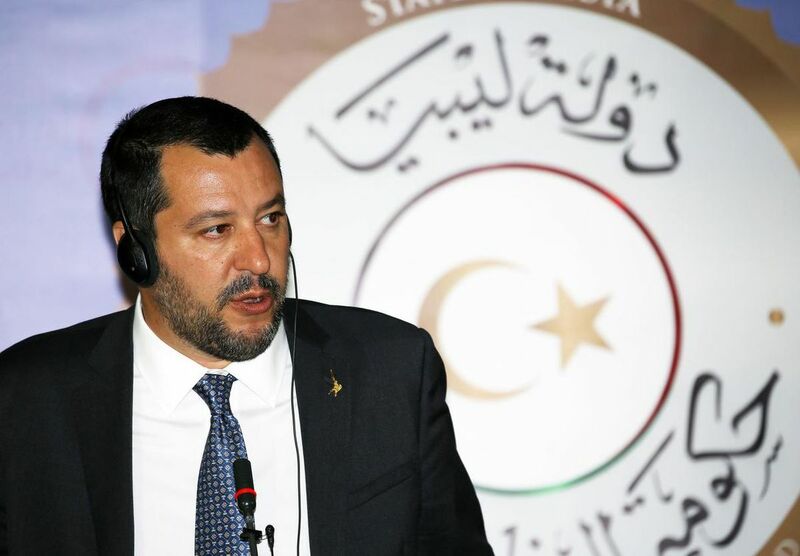 Matteo Salvini made his first official visit abroad to Tripoli, Libya’s capital, to hammer home his commitment to ending the migration flows that have fuelled anti-migrant sentiment across Europe and brought his xenophobic party to power. Speaking at a press conference with Ahmed Maiteeg, the deputy prime minister of the UN-backed Libyan government, Salvini insisted that new proposals in the European Union to create asylum identification centres for would-be refugees must be located at Libya’s southern borders — not in Europe, as France initially proposed. Salvini also vowed to help Libyan authorities assume control over Libyan territory, including its territorial waters, to prevent migrants from leaving. Libya was plunged into chaos following the 2011 uprising that ousted and killed longtime dictator Moammar Gadhafi and is now split between rival governments — one, backed by the United Nations, based in Tripoli, and the other in the country’ east — each supported by an array of militias. Since then, it has been frequently used as a route to Europe for migrants fleeing poverty and conflict in Africa and the Middle East. Maiteeg announced that the Libyan coast guard had rescued some 1,000 migrants on Sunday, including dozens of women and children in several different rescues. All migrants were given humanitarian and medical aid, and were taken to a naval base in Tripoli and a refugee camp in the town of Khoms, he said. Salvini has accused these NGOs of operating as taxi services for Libyan-based smugglers. He has closed ports to their rescue ships, and on Sunday, the Italian coast guard declined offers of help from a Spanish NGO to take part in the rescue. He backed Libya’s proposal to create a centre to study migration. Before Italy’s new coalition government was installed, Italy already worked to bolster the Libyan coast guard’s ability to patrol its coasts and to bring back migrants who launched from its shores. Human rights organizations have criticized the practice, alleging that migrants are abused in Libya and the North African country hardly constitutes a “safe” port of call, as called for by international law.